Teachers of grades 7- 9 often ask me to read from Under a Living Sky and answer questions. The students are quite interested in the Great Depression and in the writing life. As the recent award indicates, the book resonates with young readers of all ages and invites plenty of discussion. 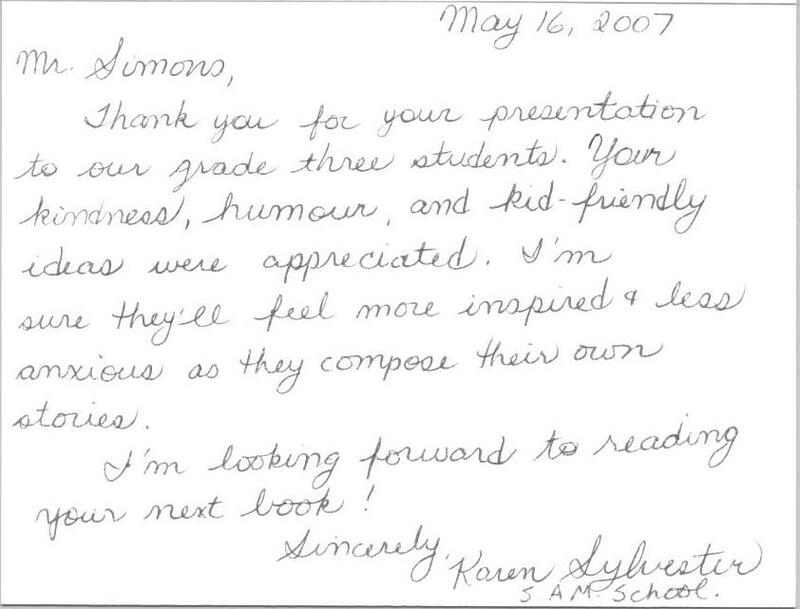 I conduct many “actual writing” workshops for grades 4-6; these are always a hit, generating lots of enthusiasm from the students (even from reluctant writers), not to mention a curious, surprised satisfaction from the teachers! For groups that might include grades 3-6 in a single presentation, I have something I call "The Web of Human Life." This is a presentation which requires 15 minutes, 10 volunteers, 5 ropes, and an antique cream can. Students take away a vivid mental picture of life in the Great Depression, when for many people the supports of human life were all but withdrawn. I act as a living history resource to grade four classes as they work on their Canadian history segment. They then produce their own essays about the Dirty Thirties. For the grade threes, I have developed "Where Ideas Come From." This is an interactive session in which we dive into our creative sources. I trace how ideas come to us and then show how to generate specific ideas that we may use in our writing, with promptings from Under a Living Sky. This is a writing workshop requiring no writing by the students, unless the teacher expects it! Since November 2005 I have presented to thousands of students, from grades three to nine, representing dozens of schools across Alberta and Saskatchewan. Yes, there is a fee! The normal fee for an author coming into any school starts at $250 per half day (2 hours of class time). For financial help on getting me into your school, visit Young Alberta Book Society or Canadian Authors, Alberta Branch (WISP). Both of these societies have annual programs to promote literacy in schools. If readings, resource or workshops are not exactly what you require, I am happy to tailor my presentation/visit to suit your needs.